Many people think that most chest congestion symptoms do not require a visit to the doctor. While this may be true, it’s not always easy to tell what is causing the congestion. That is why a visit to the doctor is often the safest bet. 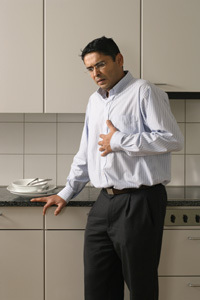 Some chest congestion symptoms are caused by an infection. If this is the case, there will be other symptoms such as a fever and lethargy. If you suspect an infection, a visit to the doctor should be scheduled. While some types of infections will pass on their own, others may require the use of antibiotics. In some cases, chest congestion symptoms could be caused by heart problems. Many people do not associate chest congestion with heart problems, but if the heart is not operating efficiently, this is one possible side effect. If other symptoms include swelling in the ankles, shortness of breath, chest pain or irregular heartbeat, you should visit the doctor or emergency room immediately. For some people, certain organisms in the air, such as pollen or smoke, can irritate the bronchial tubes enough to cause some chest congestion symptoms. Often, when this is the cause, the symptoms will ease after you have been away from the irritants for several hours. Of course, there are other possible causes as well. The three above were simply examples of possible causes for chest congestion symptoms. So what are some of those symptoms exactly? Of course, it is always better to play it safe and pay a visit to the doctor. Anytime there is an issue with your respiratory system, you want to err on the side of caution. It is better to visit the doctor and learn nothing serious is wrong rather than put off going and have a serious problem get worse. Once you visit the doctor, here are some ways that you can find a bit of relief from some of your chest congestion symptoms. For some people suffering with chest congestions symptoms, steam can bring some quick relief. One way to get steam into your respiratory tract quickly is to boil a large pot of water and then hold a towel over your head and pot as the steam rises. Breathe deeply. Another way is to run a very hot shower at full blast and allow a small bathroom to fill with steam. Often, a hot drink can help loosen congestion and provide relief to irritation in the throat. For congestion accompanied by a cough, you may be able to find relief in over the counter cough medicines. Of course, if you have any other medical conditions, you should not take any over the counter products without an okay from your doctor. In some cases, the only appropriate way to treat the symptoms will be with medication prescribed by your physician. It is important to take the medicine exactly as prescribed. Do not stop taking the medicine just because you feel better. Instead, finish the entire prescription unless instructed otherwise. If you are suffering from chest congestion symptoms, see your doctor to be sure the problem is not serious. Such symptoms should never be ignored.